You'll get a crispier, golden potato when baked in the oven but it takes 45 minutes. This method takes 10. Pierce the potato with a fork all-around multiple times. This lets the steam out while cooking. Pour 1 TB of oil in a bowl with a dash of salt & pepper. Roll potato around in oil mix to coat all around. 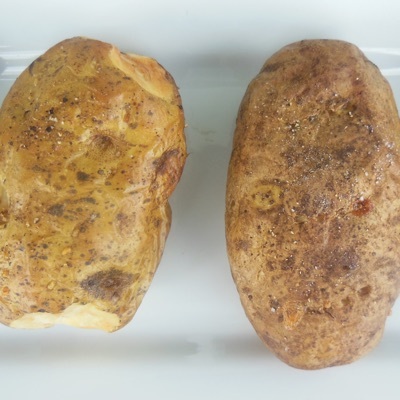 Place the potato in a microwave-safe dish and microwave on high for 5 minutes. Flip the potato and microwave for another 5 minutes. It's done once it's tender in the center when you pierce with a fork. Microwave for longer if needed. Let potato cool before cutting. Enjoy!